Goodreads Summary: Eden didn't expect Az. Not his saunter down the beach toward her. Not his unbelievable pick-up line. Not the instant, undeniable connection. And not his wings. When I read that stories are about angels and/or fallen angels, I tend to think that the story is going to follow a fairly familiar pattern. A Touch Mortal was definitely something different and gave more complexity to the age-old good vs. evil battle. Eden's life isn't what she would call happy. It seems as though she's becoming more and more invisible to everyone around her, and she's struggling to find something to live for. Then she meets Az and Gabe. There's something different about them, but she can't quite place it. Against her better judgement, she goes to dinner with Az. Two weeks later their relationship has become very involved, but Az knows this can't happen. To protect Eden, Az does the unthinkable... Eden is suddenly plunged into an unknown world, one of good and bad angels (Bound and Fallen) and Siders, other people like her. As Eden spends more time in this new world, she finds herself at the center of an old battle, unsure of whom she can trust with her life...or her heart. 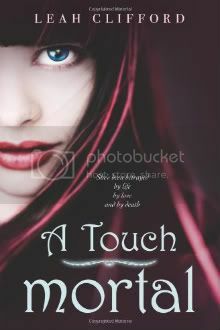 A Touch Mortal is a new take on an angel story, one with a much darker edge. I enjoyed the inventiveness of this story as well as the gradual transformations of Eden and Gabe. They both grew stronger throughout the book, proving that what is expected is not always what's right or what will happen. I also especially liked Kristen's character and her poetry quotations. Her interesting shopping habits and her snappy dialogue with Eden added yet another dimension to the book. The suspense of what side would win built throughout the book, and I was kept guessing until the end about what exactly would happen and what the truth behind everything was. However, I did have a few problems with this novel. I felt as though it was missing some important connections and explanations, causing the world-building to feel incomplete. While the story is worth deciphering things, there were several scenes that still left me confused. It is worth noting that there are several mentions of suicide in the book, and while the the subject is not explored, it is not treated lightly either. Finally, there are two time skips in this book, but rather than hurt the story, they actually move it forward. With interesting characters and an even more intriguing world, A Touch Mortal is the first book of what promises to be a good trilogy. I'll be looking forward to reading A Touch Morbid! Hi, Christin! I feel the same way you do; whenever I hear about a fallen angel YA novel, I instantly think of the Hush, Hush or Fallen storylines. Glad to know this one surprised you. See but the whole I Must Protect You So Stay Away Even Though I Took You On A Date bit is getting old in romances, and that tends to ruin it for me. When the romance feels trite. I don't know I'm going to have consider this.